After all the tragic Chinese stories I’ve read–many of them memoirs–you’d think I’d become immune to the sadness and chauvinism in these books. But it never works that way. 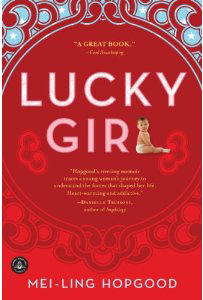 This week I read Lucky Girl by Mei-Ling Hopgood (Algonquin, 2010), which just came out in paperback. Hopgood was born to a poor family in rural Taiwan and given up for adoption when she was 8 months old. Her birth parents already had five daughters and an adopted son, but couldn’t afford to keep Mei-Ling. Or so she had always thought. (Two more sisters were born after her, one of whom was also given up for adoption). When Mei-Ling was in her early 20s, she innocently asked the nun who had arranged her adoption if she had any information about her birth family. And that’s when her old life collided with her stable American one. Months later, she flew to Taiwan to meet her birth family and learned fragments of a shattered family history. Half a dozen more trips to Taiwan shed even more light into her family’s dark secrets and why she was taken from her mother so soon after birth. I have to admit that most of the books I’ve read about Chinese culture have been set in China or Hong Kong. I always assume people in Taiwan were more like those in Hong Kong–traditional, yet in tune with modernity. East meets West. But then I have to remind myself that Taiwan’s outside influence hasn’t come from the west like Hong Kong’s, but from other Asian countries like China and Japan. And with that influence comes old fashioned ideas about gender. Like how boys are preferred over girls–at any cost to the family–so the boys can care for their parents’ graves after they pass away. But as Hopgood writes in her epilogue, she has her own way of carrying on her birth family’s legacy. And for that we are all lucky. Just bought the book! Looking forward to it.